4 Celli. 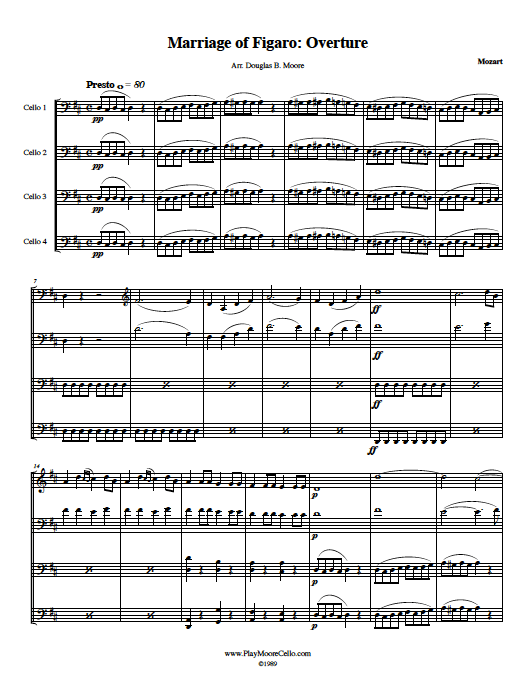 A very effective arrangement of a wonderful piece, and works well for a talented cello quartet or cello orchestra. It was played by an orchestra of over 2 dozen cellists in Jordan Hall at the occasion of Lawrence Lesser’s retirement as President of New England Conservatory. Cello 1 and cello 2 are difficult, treble clef, while cello 3 and cello 4 are intermediate. See and hear it played by the Boston Cello Quartet on Youtube and included in their CD "Pictures". My arrangement of the Marriage of Figaro Overture by Mozart for 4 cellos was played by the Vienna Philharmonic cello quartet on their 2019 New Years Eve concert. That concert was broadcast in this country but not the intermission feature with my piece. However on the BBC it was played. Here is the YouTube link. Scroll forward to 37:30 for my arrangement. The credit, with my name, is at 59:20. Enjoy!